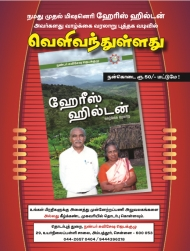 As on July 2012, FMPB has undertaken Bible Translation in 14 languages. They are Malto (Sauriya Pahadiya), Malto (Kumarbag), Chodri, Vasavi Ambudi, Vasavi Dehwali, Vasavi Khandeshi, Varli Dogri, Varli Dawri, Varli Nihiri, Dungra Bhili, Haryanvi, Pawri, Khandesi Bhili and Kurux. Six more languages are to be taken up for translation shortly. FMPB is equally concerned about giving dignity, status, and economic upliftment to the poor believers. It has successfully launched in co-operation with its sister concerns and other partner agencies, socio-economic uplift programmes in different mission fields. Medical Mission, Veterinary Mission, Child Care, CDC (Child Developement Center), Agriculture, Seed Bank, Small Scale Loans, Adult Literacy, Vocational Training, Creches (Balvadis) and schools are some of the development programmes undertaken by FMPB. Description About Bible Translate 2. Description About Bible Translate 1.